This is the first of several pages containing technical information articles. If your piano has a problem, there will be something about it here! Some of the PDF articles here were designed as promotional Information Sheets for clients. They are included as general information on piano repair and maintenance tasks. it's not intended to suggest that your piano needs everything described in these articles! To view the PDF articles more easily, you can click to expand them to full screen. Among the most frequently seen broken parts on older upright pianos are bridle straps (also called bridle tapes). These little fabric tapes with leather ends connect together the two main parts of the action for each note; the hammer and the wippen. They assist the hammer to rebound from the string. Sometimes the leather (or synthetic) ends are perished, and sometimes the fabric tape. 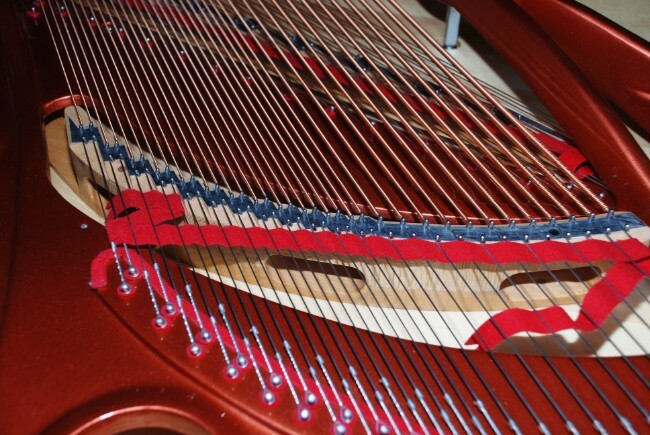 English-made pianos have a slightly different way of securing the tape ends from what is shown here. Over time, playing causes the piano strings to make deep grooves the hammer felt. Restoring the playing surface as described here is one of the most worthwhile tasks for an older piano and can make a huge difference to the tone quality for relatively little expense. A problem often found in older pianos is loose tuning pins. The wooden plank that holds the tuning pins dries out with age, the tuning pin holes get larger, and the pins become too loose to tune properly. Over the years various liquid "doping" solutions were used by technicians to tighten the wood round loose tuning pins, with limited success. About twenty years ago however, technicians in the USA discovered that very low-viscosity CyanoAcrylate glue - Superglue - is an extremely effective treatment. It works quickly and permanently; not to stick the tuning pin to the wood, but to reconstitute the wood fibres. The superglue treatment has now been used on very many older pianos, and reports are universally positive. This fact sheet describes the technique. It can be applied to just the odd loose pin, or to the whole piano. This discovery means that pianos which would otherwise have to be discarded can be revived and serve usefully for many more years. Here's a bit of history. Instructions for home piano repairs, from a 90 year old set of DIY manuals called The Amateur Mechanic published by Waverley Books around 1920. The photos and line drawings are interesting. But I would not recommend actually trying any of the suggestions!